Beirut (AFP) – Hundreds more pro-regime fighters have been deployed to front lines in Syria’s Eastern Ghouta, a monitor said on Wednesday, tightening the noose around the shrinking rebel enclave. “At least 700 Afghan, Palestinian, and Syrian loyalist militiamen came from Aleppo and were sent late Tuesday to Ghouta,” said Rami Abdel Rahman, head of the Syrian Observatory for Human Rights. The Britain-based monitor said the reinforcements were deployed to two main battlefronts on the western side of the enclave, including the town of Harasta. 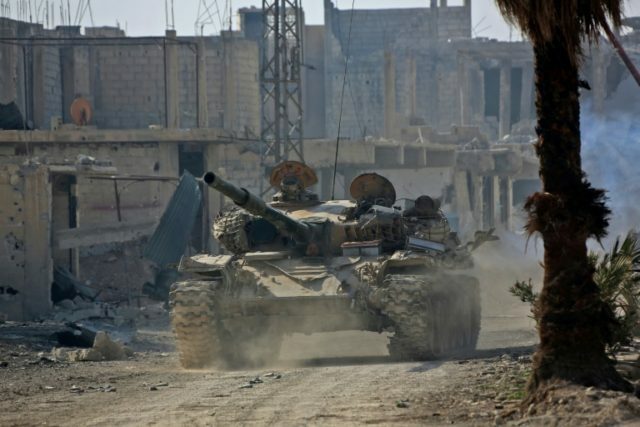 The Syrian army and allied militia launched an offensive on February 18 to retake Eastern Ghouta, the last rebel-controlled region near the capital Damascus. They have since recaptured more than 40 percent of the enclave with support from a devastating bombing campaign that has killed more than 800 civilians. By Wednesday, government troops were at the edges of several key towns, including Misraba, Beit Sawa, Jisreen and Hammuriyeh. AFP correspondents in Eastern Ghouta heard warplanes overhead carrying all out strikes on the battleground towns. Two barrel bombs hit Al-Rihan, near the enclave’s largest town of Douma. The raids came despite a daily “humanitarian pause” announced by Russia last week that is meant to bring calm to Eastern Ghouta between 9:00 am (0700 GMT) and 2:00 pm each day. Moscow’s initiative has fallen short of the UN Security Council’s demand more than a week ago for an immediate ceasefire for Eastern Ghouta. The council is to meet at 1500 GMT on Wednesday to discuss the failure of the truce to take hold.